Purchased in 1998 from the previous owner in Adelaide, South Australia. 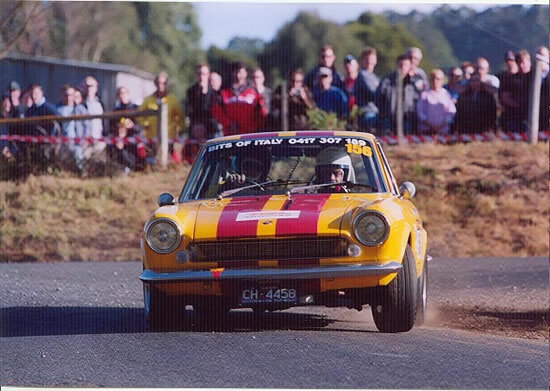 The aim was to rebuild the car as a Tarmac Special Stage Rally Car for use in Historic Rally events like the Targa Tasmania. The car had been set up in the 80s as a club racer and was fitted with a modified 1800 engine from the CC coupe, alloy half cage, 13” x 7” alloy wheels and some minor suspension mods. It was however, in a very sorry state having been stored for the previous 8 years in an earth-floor shed. It suffered from rust in all the usual sections and the interior had become home to both possums and rats, which rendered nothing of the trim in a state worth saving. 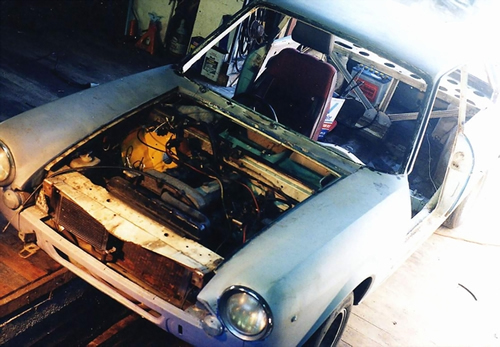 Once the car arrived home the shell was stripped bare of all components. New steel rust–replacement sections were fabricated and welded in where structural integrity was required, while fibreglass was used to repair cosmetic sections. 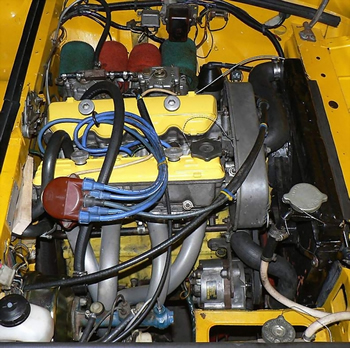 The 1800 engine was cannibalised for its cams, baffled sump, oil cooler, electronic ignition, twin Webers and extractors, which went into a 1600cc engine to comply with the pre-1970 model, run on rules for classic tarmac rallying. The Koni Shockers were reconditioned, all the suspension rubbers replaced with nylothane bushes and another complete interior sourced. The process took about 6 months of evening and weekend work but finally the car was roadworthy, raceworthy, dyno-tuned, registered and insured for an overall total cost of just $7000 which included the purchase price. 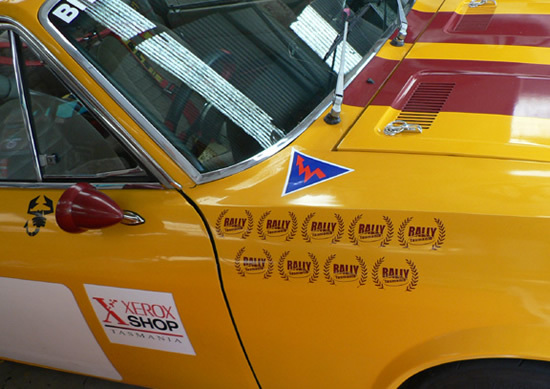 Since completion of the car in December '98 it has competed in 9 Lactos Heritage / Rally Tasmania events placing as high as 8th outright and 3rd in class. 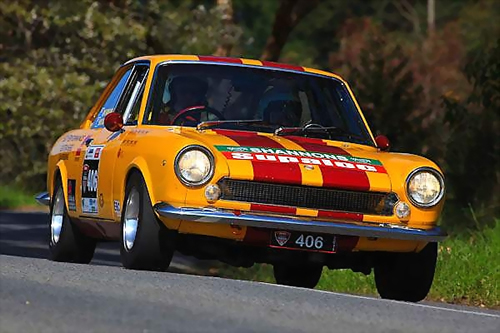 It has also competed at numerous race meetings, hillclimb events and local rallies, as well as the Australian Fiat Club Nationals. 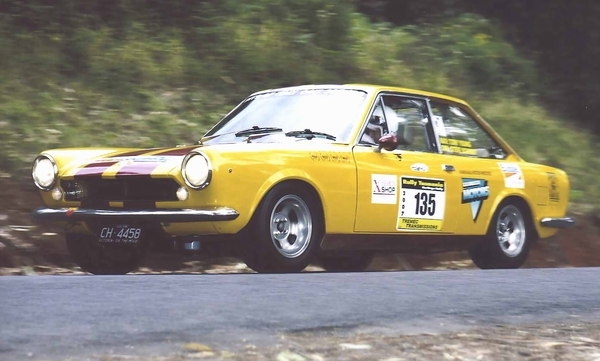 The Coupe was built primarily to compete in the classic category (pre 1970) of tarmac special-stage rally events such as Targa Tasmania and Rally Tasmania. As such it was built with reliability and strength in mind, which has been justified with a 100% finishing record over the past 10 years. 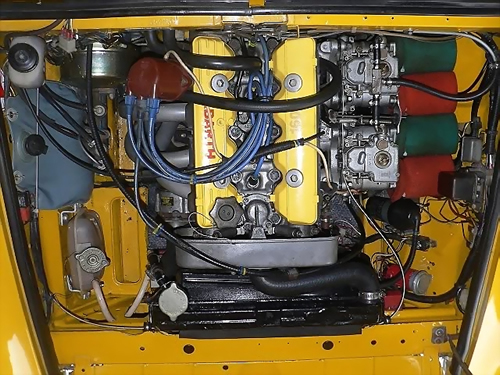 Engine: Fiat 1592cc twin-cam unit with 35-75 cams, twin 45 DCOE Webers and 10:1 compression, extractors and light flywheel. Develops approximately 125 bhp at 6500 rpm on 98 RON pump fuel. 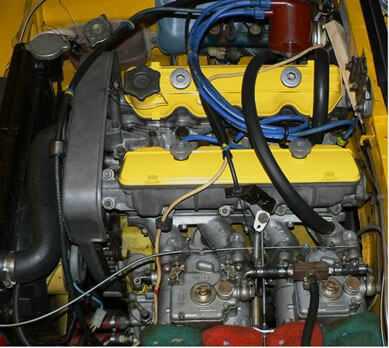 Gearbox: Standard Fiat 5 speed all syncro, using the closest set of standard ratios. Front: Standard double wishbone front end with anti-sway bar. 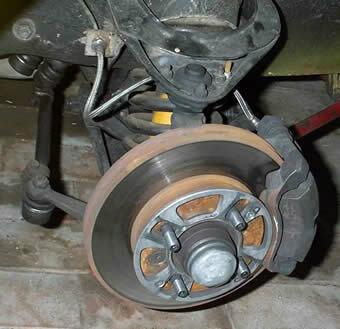 Fitted with Fiat 132 uprights, stiffer swaybar, lowered coil springs and adjustable Koni shock absorbers. Rear: Standard coil sprung live axle with torque tube, trailing links, swaybar and Panhard rod. Lowered springs and Bilstein shock absorbers. 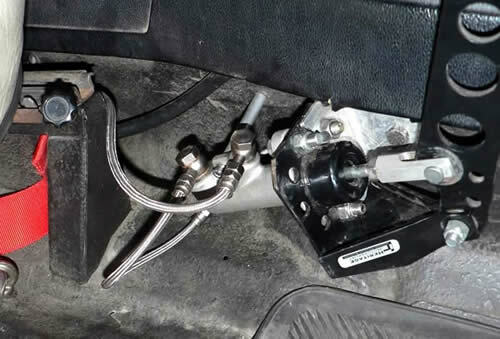 hydraulic handbrake: The hydraulic handbrake is there for motorkhanas or extremely tight corners in tarmac rally events. As you probably already know, the 124s have a very weak standard handbrake that barely holds the car on a steep hill and is useless for handbrake turns. The hydraulic unit doesn't replace the standard handbrake and it's located against the transmission tunnel close to the floor and forward of the drivers seat mounts. 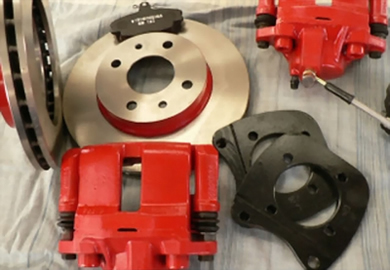 Fitted with Limited Slip Differential: The diff is what the Yanks call a 'Phantom Grip LSD'. 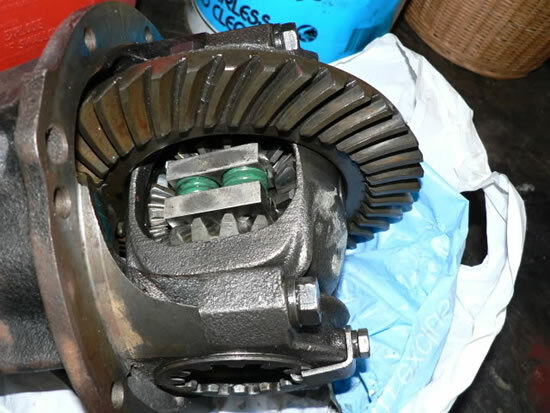 It's not really an LSD, but rather a relatively cheap (and some say nasty ) modification to the standard open diff which resists slipping to a certain extent. It's not anywhere as good as a proper LSD, but certainly more effective than an open diff when powering out of a tight corner. How it works? The diff is stripped down and reassembled with a couple of spring loaded plates between the output gears. The tension on these plates makes the gears turn together rather than independantly as they normally would until the torque from the engine exceeds the traction and spring loading in the diff. At that stage the wheel with less traction will slip. Some say these diffs cause wear on the gears and thrust washers, but after 10 years of hard use there is still no sign of wear, the springs eventually soften though and they've been replaced twice in that time. I also use the same diff modification in my Spider and Austin Healey Sprite and have had no issues with reliability or wear. For more information contact Bill Freame (FCCV) or Phil Buggee (Bits of Italy, Melbourne) for details and costs. Wheels and tyres: 13 x 7 alloy rims fitted with 205/60 x 13 Yokahama 032R or equivalent tyres. Other modifications: Full alloy roll cage, battery relocated to boot, & electronic ignition. Interior: Naturally being a rally car the interior has to be fully equipped to precisely navigate the long excursions and stages. A - Terratrip, accurate, programmable distance measuring device. Air horn button beneath Terratrip for co-driver’s use. B - Left & Right arrows for dyslexic co-drivers and clip for holding time sheets, bulletins notes etc. C – Stopwatch for double-checking stage times and Calculator. D – 12V DC power socket for phone charger tyre pump & lead light. E – Padded leg brace and hand hold for co-driver. Mobile telephone mounting and pen holders on other side of padding. F – Flexible 12V map reading light. H – Hydraulic handbrake handle. I – Seems to have been missed !! J – Fuel cut-off safety switch relays – Fuel pumps will only work while there is spark generated by the coil. If the engine stalls, the fuel pump stops. K – Extra gauge and switch panel. Gauge shows Volts DC. Over-ride switch and tell-tale light for engine cooling fan. Also Windscreen Demist switch. L – Bright interior light. M – Tachometer turned around to make high rev area easier to see. Mechanical oil-pressure gauge replaces electric unit. N – Extra switches (normal and backup) for fuel pumps and lights. O - You can just see the red top of the 12V Battery Isolating Switch behind the padding, this can be operated inside the cabin or from outside via a clearly labeled emergency pull cable. 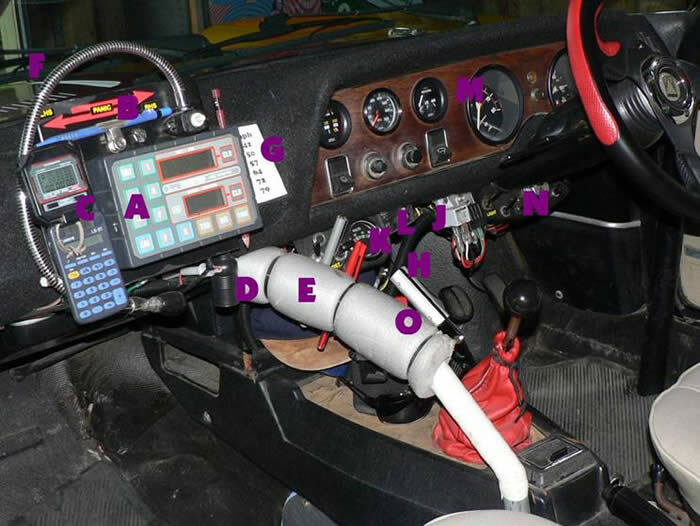 * - Terraphone helmet intercom system mounted on rollbar main hoop between seats. * - Helmet hammock behind front seats for helmet stowage on transport stages. 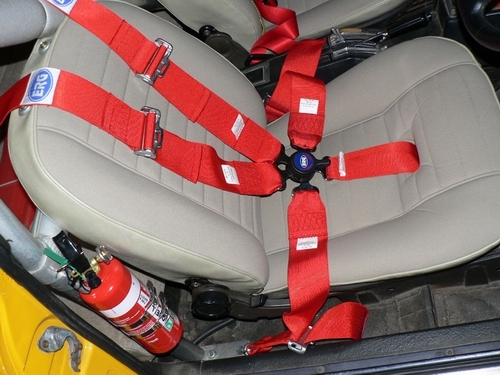 * - 2 dry powder fire extinguishers attached to rollbar hoop uprights next to driver and co-driver. This year was our year to do Targa Tasmania. My co-driver and I had been competing in Rally Tasmania for the past 10 years, but had never had the time or money to embark on the ‘Ultimate Tarmac Rally’, but this year it was going to happen – World Financial Crisis or not ! It would be foolish to embark on a project like this without undertaking some preparation to our Coupe, and a calamity if a mechanical issue put us out of the rally during Day One of the six-day event, but it has been known to happen! 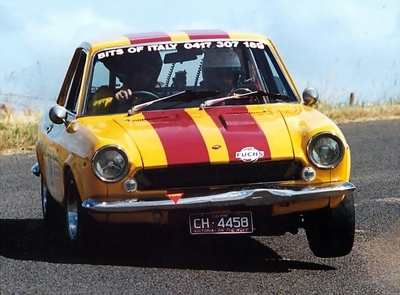 With that in mind our 1968 Fiat 124AC Coupe was given new brakes, new clutch, new tyres, a gearbox inspection, a rebuilt diff and steering box, even new un-scratched side windows as well as some additional wiring and new 6-point harnesses to meet the latest safety requirements. 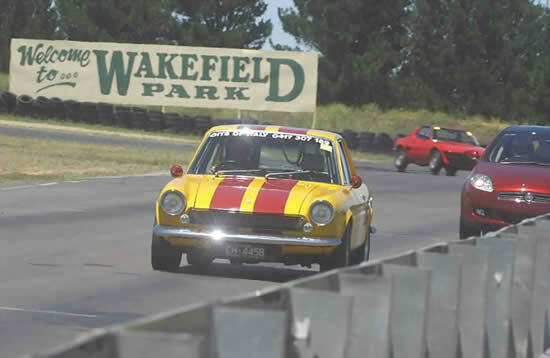 It was then taken to Wakefield Park near Goulburn, NSW for a shakedown at the Australian Fiat Nationals in January where it performed very well. It was also at about this stage that Bits of Italy in Melbourne offered to share their support crew with us. This was a tremendous load off our shoulders as it meant that we would have spares available if they were required. The roads chosen for the event’s 40 Special Stages are absolutely magnificent and range from a few short town/spectator stages of 5km to more demanding stages of up to 48km in length. The event covers over 2100km of which 460km are made up of these closed-road Special Stages where cars are sent off – slowest to fastest - at 30 second intervals. We had a great time running and dicing with the same group of cars each day. They included a couple of 944 Porsches, an early E-type, Alfa GTVs, a couple of classic Cooper S's and a later model Fiat 124 coupe. We endured almost 4 fine sunny days, then two wet days on the notorious Tasmanian west coast where the roads were very fast and very slippery - the recovery teams busied themselves each evening dragging exotica out of the shrubbery. The coupe performed faultlessly, we saw 120mph on the speedo quite frequently (obviously optimistic), but when it's in the rain and low cloud mist along a mountain ridge with blind crests taken flat out - it certainly feels at least that fast. The only spanners we laid on her was during a precautionary brake bleed half way through the event. The brakes really take a caning with lots of long downhill sections and it’s nice to have the security of knowing there's fresh fluid under the pedal. Our support crew refuelled us once on Day Six, but they, like us, were happy to leave the crates of spares unopened. 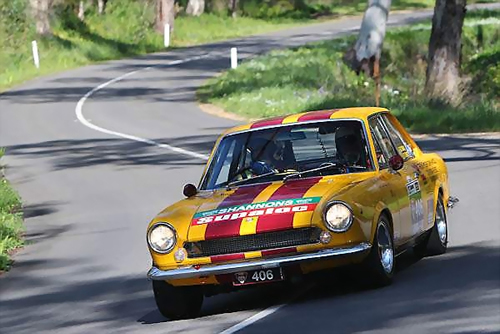 We were very pleased with our result, finishing with a Targa Plate for completing each stage within the 'Trophy time' specified for our category, and placing 18th out of the 42 entries in the Early Classic category. A fantastic event, a pleasing result for the old Fiat and well worth the effort to get there. We even managed to grab a few seconds of National TV coverage in the 1-hour special broadcast after the event. If you ever get the chance to have a drive at this new hillclimb circuit, located about 140km east of Melbourne, then give it a go. This in-car video was taken from my AC Coupe during Round 6 of the Vic Hilclimb Championship which used the Figure 8 version of the track that is about 1400metres in length. The video run was the final run of the day, a bit ragged ( understatement) and certainly not the fastest way around, nor was it the coupe's fastest run of the day; but it gives you a good idea of how busy this track is. This was the Coupe's first outing since Targa Tas and it performed faultlessly, pity the same can't be said about the driver . My 2011 had been a relatively quiet year in regard to motorsport participation. 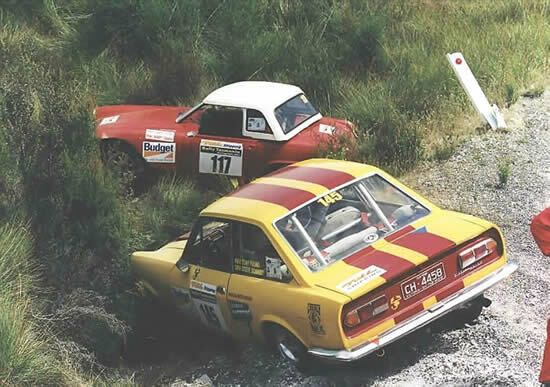 The self-imposed withdrawal was the result of having committed early on to, and blown my competition budget on yet another classic tarmac rally event. These events are addictive and once you’ve had a taste, you’re always looking for more. This event would be our 12th in 14 years and number 11 for the Coupe. 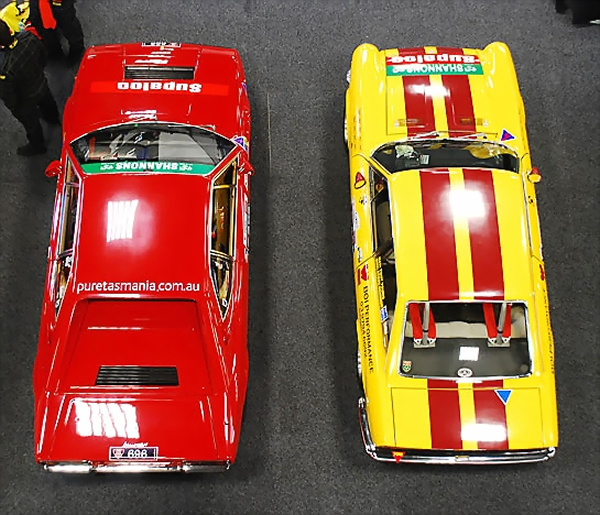 Octagon (promoters of Targa Tasmania, Targa West etc.) 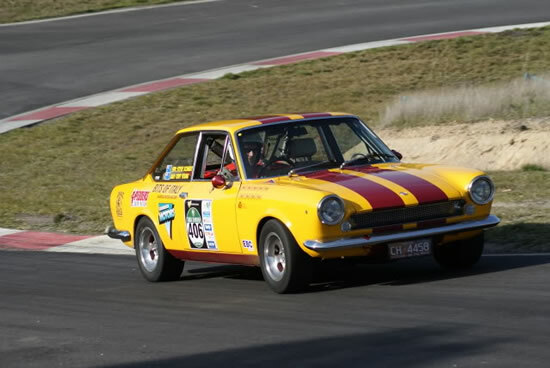 had resurrected the Classic Adelaide event from its 2010 collapse under another promoter and renamed it the Classic Targa Adelaide. 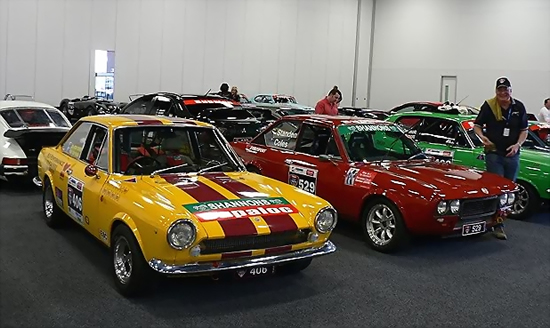 It would be a 4-day tarmac, special stage event based at the Adelaide Showgrounds and incorporating Legs in the Barossa Valley, Adelaide Hills and Fleurieu Peninsula. Over 220 competitive kms were divided into 26 special stages ranging in length from a short town stage through Tanunda of 3.5kms to several longer 19km stages. Vehicle categories included Early Classics (up to 1971) Late Classics (1972to 1985) and Early Modern (1986 - 2002). These categories were divided further into various class capacities and levels of modification. 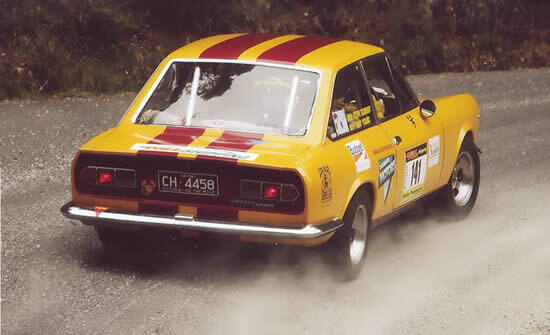 Our 1968 Fiat 124 AC Sports Coupe found itself in a class of its own and with the second smallest engine capacity in the field. 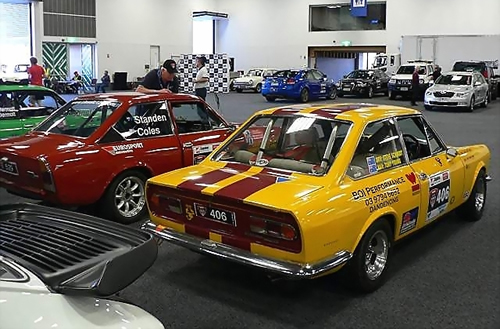 Supported by my regular Co-driver Tony Young and encouraged by South Australian Fiat competitor Guy Standen (1974 Fiat 124 CC Coupe), plans were made, things put in place and it all started coming together as the event drew closer. Guy with co-driver Andrew Coles were gracious in their hospitality, even offering to share their support crew consisting of Graham Standen and Mike Coles, who would follow the event carrying our spares in case the need for a roadside repair arose.Unfortunately, due to the limited amount of time I could get off work, Tony and I were only able to fully pace-note about half the event, meaning we would be driving some stages from the Road Book, which only notes situations on the Special Stages where care or caution is required. Those stages which we did have a preliminary run over were quite fast and highlighted the need for care as the roads were bumpy, narrow and lined with massive white-trunked eucalypts right up to the edge of the tarmac. 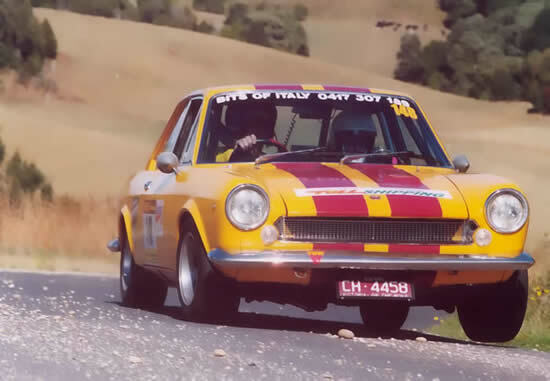 The first day saw the competitors heading for the Barossa Valley for 2 prologue stages which would seed the cars in their starting order for the following 3 days. We were placed toward the slower end of the field and would start off near the front each day chasing a Porsche 911 and followed by an Alfa GTV, MGBGTV8 and a Porsche 944 Turbo. The following 3 days were a bit of a blur. The organisation was very good, meaning that there were seldom any long delays, with most stages ready to run soon after we arrived. We covered over 700km on those 3 days which included some breathtakingly fast special stages where despite the Fiat’s speedo running out of numbers, we were overtaken by the MGBGTV8 and 944, then there were some superb twisty stages such as the 16km Gorge Road Stage that suited the coupe, enabling us to catch and pass the 911 we had been chasing all day. It was great fun, the competition friendly with nobody playing for sheep stations at our end of the field. 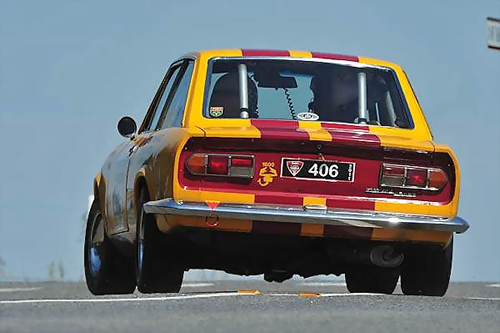 The South Australians were welcoming and the car performed faultlessly to finish 11th out of 21 in the Early Classic category. Congratulations to Guy and Andrew who placed their CC Coupe 6th out of 31 in the Late Classic category and special thanks to Graham and Mike for watching over us during the event. The most arduous task they needed to perform on either Fiat was cleaning the windscreens.